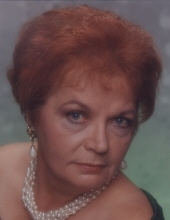 Redmond, Utah - Our beloved mother, grandmother, great-grandmother and sister, Betty Jean Martin Honeycutt Brailsford, age 73, passed away March 26, 2019 at her home in Redmond. She was born October 21, 1945 in Greeley, Colorado, a daughter of Henry and Charlotte Koch Martin. She attended schools in Ft. Collins, Colorado. Betty married Grady Eugene Honeycutt March 17, 1963 in Ft. Collins, Colorado. He died March 18, 1998. She married Ronald Brailsford September 9, 2003 in Las Vegas, Nevada. He died December 25, 2016. Betty graduated from Academy #26 with the Department of Corrections and worked at the Gunnison Prison. Betty loved going to Mesquite. She enjoyed dancing, movie nights, loving on her dog, Tootsie, but most of all, spending time with her family. She will be missed. Betty is survived by her children: Delbert Eugene Honeycutt , Shaun Edward and Dawna Honeycutt, all of Salina; Travis Alan and Penny Honeycutt of Redmond; 7 grandchildren: Sierra and Jon Castleman, Grady Honeycutt, Shastell Honeycutt, Aubrey Honeycutt, BrynLee and Andrew Pickering, Desmond and Morgan Honeycutt, Branson Honeycutt; 6 great-grandchildren: Dylan, Traigun, Jextyn, Staxzyn, Slaidynn and Brooks; brother and sisters: Hank martin of Loveland, Colorado; Maggie Perrott of Cheyenne, Wyoming; Dorothy Heimbichner of Carmichael, California and Darla Phillips of Las Cruces, New Mexico. She was preceded in death by her parents; both of her husbands; and five siblings: Elmer Martin, Joe Koch, Herb Martin, Darlene Martin and Martha Cox. A Wake for Betty will be held on Saturday, April 27, 2019 at 2:00 P.M. in the Salina Fire Station, 80 North 100 West in Salina, Utah, where friends may visit with the family one hour prior to the services. To send flowers or a remembrance gift to the family of Betty Honeycutt Brailsford, please visit our Tribute Store. Guaranteed delivery before Betty's visitation begins. Guaranteed delivery before Betty's service begins. "Email Address" would like to share the life celebration of Betty Honeycutt Brailsford. Click on the "link" to go to share a favorite memory or leave a condolence message for the family.